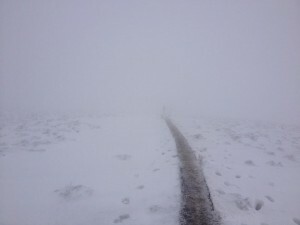 Somehow even after the worst snow storm I can remember, although I believe it may have been localised, the NIMRA massive descended on the Wicklow Way Ultra 50K in their droves. The Steede won by 20 minutes in the male category, whilst Denise Mathers took the honours in the ladies category. The results and a race report can be seen on nirunning.co.uk. Another NIMRA member Paul Nesbitt has written a first hand account of the race which we have reproduced for your enjoyment here. Sometimes, I do things without thinking. Had I clearly thought this one through? Or was it just too cold to be thinking? It’s 8.45am and we’re standing in the overflow car park at Johnny Foxes. It’s been an eventful morning as myself & Matty negotiated the lovely snowy Norn Irish roads en route to Glencullen, a lovely wee place nestled in the Wicklow hills & now we’re just catching up with a few folk. It’s actually a bit of a ‘Northern Invasion’ judging by the number plates and I think most of the Ultra scene in NI is out in force today, especially at the front of the field with 6 of the top 10 finishers being from the north. A quick glance around and it became apparent to me that everyone actually thought they were rabbits, as they hop around the car park trying to keep the heat in. During the same ‘quick glance’ I also noticed that there were not too many legs on display today. So leggings it was…Well, it would have been if I hadn’t taken that option away before I left the house…Yes, I took them out of my bag in an act of ‘Manliness’, sure I hate running in the things anyway… My shins would not thank me for this decision. So, we set off just after 9.30am (Declan actually decided to join us after taking a wee lie in) and followed the road to the foot of the first bit of climbing for the day. (This is the only real road section on the course) It was here that I remembered the old theory that the mind is a great thing for erasing painful/disturbing imagery from memory. From the‘painful’ perspective, it was that these hills seem to have grown by at least 3 times since I last ran this race in 2011. From the ‘disturbing’ perspective, Declan’s shorts fell off. I hope my mind gets shot of that one sooner rather than later. It wasn’t long until we started seeing the first signs of snow & I can tell you, although it was tightly packed in places, it still made for tricky enough running at times. Myself & Matty continued on up through the white stuff on a pretty enjoyable wee trail until we reached ‘Prince Williams Seat’(469m). Not very comfortable for a seat might I add. Matty left me for dead on the descent here as he bolted off down the hill and through the switchbacks. I followed at what I thought was a speed of Gazelle-type proportions (At least a Gazelle that had been shot in the leg) and after some great trail/rocky path we were running along a river on the flat. Flat. You really don’t see much of that here. It’s from here that we begin the big ascent over ‘Djouce’(638m)…even the mention of this place makes me shudder. 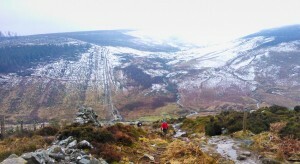 It was all pretty much plain sailing on the first part of the climb on forest trail until we reached Powerscourt Waterfall (A spectacular sight) Then the fun began, a slippy enough descent that you can see below. 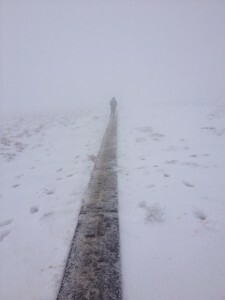 We thought the conditions earlier were bad – I don’t think I even have the words to describe what this was like! (But of course, I’ll try…) A long, slow trudge up freezing cold streams of slush water amidst ankle deep snow that gripped sometimes & refused to at others. Bumping into my mate Richard at this point, he said this is the worst he’s ever seen these hills. It was so, so cold. I don’t even know what temperature it must have been, I’m guessing -80. That’s a complete exaggeration but it felt like it!! I couldn’t feel anything from halfway down my shins (I’m still not regretting the tights decision…honest) and had noticed quite alot of blood running down my legs after inadvertedly running into alot of deep frozen snow that had decided to pierce my skin. Some craic. Oh. Sorry. No it didn’t. We then descended down to Ballinastoe for the turnaround where a few guys had decided that half of the course was more than enough for them. I don’t blame them, these were tough conditions like! We then climbed back and repeated the whole process, it was a mix of more of the same only back-to-front. I had a few issues with fuelling as I had decided to go the Low Carb/High fat route for this race to stop my sugar levels from spiking too much which has happened in past Ultras…it’s not the spiking that bothered me but the come down after! This new fuelling did work for me mainly as I got to eat loads of nuts n stuff which is always good but I did have to use a couple of gels just after the descent off Djouce as I was dangerously close to crashing. I ran the majority of the return journey on my own after having met some cracking personalities on the way out, and might I add the water station staff are legends. We put ourself through these days out in bad conditions out of choice & we really do owe so much to these people & IMRA for giving up their time. Another legend among the many others from my day out in the Wicklow hills. All in all, a day none of us will be forgetting soon!